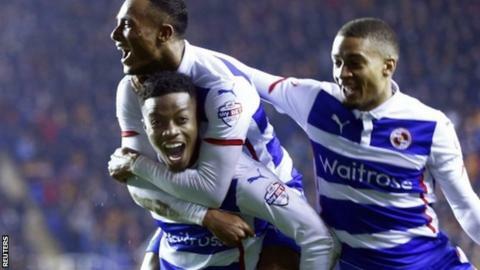 Reading's Nathaniel Chalobah (facing), Michael Hector (r) and Jordan Obita celebrate their side's third goal in the quarter-final replay win over Bradford. Reading and Aston Villa will have to win the FA Cup if they are to qualify for next season's Europa League. Uefa introduced a new rule in July that if the domestic cup winners had already qualified for the Champions League, the spare place would revert to the league. Previously, the beaten finalists would qualify, as Hull City did after losing last year's final to Arsenal. The Gunners, second in the Premier League, are likely to secure a European place through their league position. Liverpool are currently fifth in English football's top-flight and will also play in European competition next season if they finish in the top six. But for Aston Villa, 15th in the Premier League, and Reading, 18th in the Championship, only victory in the Wembley final will do. Reading play the Gunners at Wembley in Saturday's semi-final, which kicks off at 17:20 BST and is live on BBC One Radio 5 live and the BBC Sport website. Villa meet Liverpool on Sunday at 15:00 in a game that the BBC is covering live on radio and the website, with highlights on BBC One. Villa have not played in Europe since 2010-11, when they were beaten by Rapid Vienna in the Europa League play-off round, while it would be Reading's first experience of European football. If Arsenal win the FA Cup, or Liverpool do so and finish in the top six, the last Europa League spot will go to the team seventh in the Premier League, currently Tottenham.